Freemasonry is a secular fraternity of men who share an interest in moral and spiritual values and a vision for themselves, their families, and society that emphasizes the best and most enlightened thinking about life, both public and private, and how it should be lived. Freemasons have a strong dedication to traditional moral and ethical values; the three great principles of Freemasons everywhere are brotherly love, relief (by which is meant charity), and truth. Tolerance and a respect for the opinions of others, the practice of charity, and a reverence for truth and high moral standards are hallmarks of Freemasons worldwide. Freemasons encourage every man to develop his own character and his unique talents and abilities through education and study. For more information, please click here to read an explanation of Freemasonry from the Masonic Renewal Committee of North America, or you may click here to enjoy a beautifully illustrated history and introduction to Freemasonry from the Grand Lodge of Western Australia. Why has Freemasonry been so successful? Freemasonry exhibits a strong vitality, and has attracted thousands of new brethren annually over its three centuries of existence. Since the years preceding the formation of the first Grand Lodge of England on 24 June 1717, Freemasonry has grown to a worldwide network that probably exceeds five million brethren in all parts of the globe. Freemasons are noted for hard work and purposeful activity, including social, charitable and community events, as well as programmes directly concerned with Freemasonry. Freemasons have always been associated with the best cultural standards and practices. Noted men of arts, letters, sciences, music, diplomacy, politics and religion have long been brothers of the Masonic fraternity. Significant numbers of the founders of the United States were Freemasons, and applied the principles of Freemasonry to the embryonic nation that was to become the first modern experiment in democracy. Freemasons are great patrons of the arts. Freemasons encourage educational development through a plethora of scholarship programmes. Perhaps the most visible evidence of the success of Freemasonry are its more than three hundred years of growth and existence, and its five million brethren worldwide; however, the real successes of Freemasonry are both ubiquitous and humble. The thousands of lodges and Masonic halls across the United States and throughout the world give testimony to the involvement of Freemasons everywhere in the improvement of their communities and neighbourhoods. Local Masonic lodges sponsor blood drives, conduct child identification programmes, present patriotic concerts and programmes, sponsor youth groups and sporting activities of all kinds for boys and girls of all ages, and participate in charitable fund raising, just to name a few of the activities where you will find your Masonic neighbour hard at work to make your small corner of the world a better place in which to live. The sum total of these thousands of Freemasons, each making his own unique, small contribution, is what makes Freemasonry an effective force in the amelioration of mankind. Freemasonry has long been considered an exemplary institution. During the late nineteenth and early twentieth centuries, hundreds of voluntary societies and fraternities were formed in the United States. The majority of these used Masonic elements in their organization, rituals and governance; often, Freemasons were directly involved as founders or members. 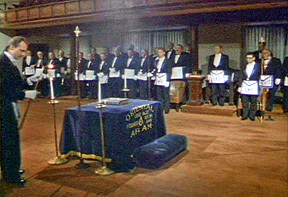 Freemasons are recognized by substantial numbers of non-Masons as being worthy of admiration and respect; Freemasons who participate in public events are regularly hailed and applauded by the general population as being noteworthy for their public spirit, high standards, and general qualities deserving emulation. The attractiveness of Freemasonry is undeniable; even men who do not intend to become Freemasons are fascinated by the history, organization, and lore of the Masonic fraternity. Some of the most appealing parts of Freemasonry are not evident until a man has actually been raised to the sublime degree of Master Mason: the comfort and tranquillity that accompany attending a lodge meeting, greeting good friends, sharing fellowship, and working together for the good of all; these are some of the things that keep men returning to lodge time after time. The beauty of Freemasonry’s ancient rituals and practices also holds a special allure for many brethren. And, of course, there are the famous “secrets” of Freemasonry, which are not secrets at all, but simply the personal growth and development a man experiences as he proceeds along his Masonic journey; for Freemasonry is not a destination; it is a journey, to be enjoyed and savoured for a lifetime. We present a selection of video recordings on Freemasonry here. You are also invited to click here to download Approaching the Portal of Freemasonry from the Grand Lodge of Vermont. You may also click here to hear audio presentations about Freemasonry from the Grand Lodge of Texas. Masonic principles have traditionally precluded soliciting a man to become a Freemason. To enter the fraternity, the prospective candidate must initiate the process, by completing a petition for degrees, and submitting it with the required fees to the lodge he wishes to join. In practice, the man who desires to become a Freemason should contact the Secretary or Master of the lodge he wishes to join, and be guided by that officer’s direction. Often, a man will have friends who are brethren of the fraternity, and they can act as mentors as he begins his Masonic journey. Many fine articles, essays and papers on Freemasonry are available by clicking here. Finally, websites of the various Masonic bodies and organisations offer a wealth of contact information for the aspiring candidate. Please see the links menu at the upper left of this page. To locate a Masonic lodge near you, please click here. If you are interested in joining the fraternity and do not know any local Freemasons, please click here. You will find a petition form available for your use by clicking here.